Today I would like to unbox, test and review some brand new equipment I’ve received from Rebtech. If you haven’t heard about them before, you might want to know that they offer some interesting mining solutions, including some stuff we haven’t really seen before. Rebtech is a Romanian IT company. Founded in 2012, RebTech started off like a computer parts reseller. 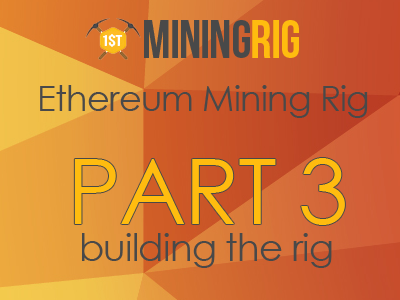 The same year, they have started to manufacture and sell their own equipment for crypto mining. I’ve been acquainted with the company for a while – back in 2016 I used to buy GPUs from them because they offered low prices and had the cards I needed in stock. Today, they have their own brand of RX 470 GPUs, mining motherboards and complete rigs for sale. The main selling point here is probably the fact that the equipment Rebtech offer is mining oriented. Every component they sell is optimized for mining and is pretty much plug and play. I will detail that in a bit. Besides, their products have a fair and competent price. I have finally received one of each product I detail below. Let’s unbox and test them out! The card comes with inbuilt PCIe USB risers – all you have to do is to use an USB cable to connect the card to the motherboard! The sturdy metal shell offers superior protection to every side of the card (including the back side) and makes it easier to install it in a mining rig frame. In fact, stacking 6-8 of those is easier than generic RX470s – the case is designed on a way to make the card smaller and facilitate air flow. Plus, it fully isolates the card electrically. The card comes with two 90 cm fans that are pretty silent even when running full speed. While it does come with an HDMI video out connector, I would not use it – the Rebtech motherboard features its own video output port and an APU to process the graphics. What is also interesting about this card is that it comes with a dual switch modded BIOS – I didn’t have to do any of the usual modifications to it. It was pretty much a plug and play experience. Besides, the kit included a custom made 1600W PSU. From what I’ve seen, the device was designed and manufactured by Rebtech from scratch – it does not look similar to any other PSU I’ve seen before. By the way since the card comes with 2 x 6 PIN PCI Connectors you don’t have to have an ATX power supply to power it. The build quality is pretty good – I haven’t found any flaws upon inspection. Both the PSU and the card feel solid and rugged. What about mining hashrate? First of all, I have tested the card with Ethereum. Not that I usually mine it – it’s just Ethereum became sort of a benchmark coin, so I have left the card mining ETH for a bit. The second thing I’ve got was the motherboard. The board is really small and can be compared to the size of a GPU. This means that it has got only those features you need to run a mining rig. Say, ASrock and Gigabyte tried to make mining edition motherboards in the past, though now I see that Rebtech is the first company to manufacture a truly mining-oriented board. The motherboard comes with everything we need for mining, including a LAN controller, a 120 GB SSD and even a metal support bracket with three holes to attach it to a rig frame the same way you would attach a GPU. Instead of the usual 16x/1x PCIe slots, it features 8 x PCIex via USB3.0 Connectors. This means that you have to use simple USB cables to connect the GPUs to the board. No need to buy risers. The USB cables are included in the package. This is pretty neat because risers usually are one of the weakest links in the chain – they can get loose and lose contact with either the GPU or the board. Getting rid of this issue often translates into better stability, as well as an easier setup. CPU-wise, the board comes with a dual core AMD A6-8500P APU that also features four graphic compute cores. It’s definitely not a top-end model, though I find it good enough at what it is supposed to do. The board also comes with 4G DDR3 RAM and some additional USB ports to connect peripherals and flash drivers. Just like the GPU and the PSU, this motherboard is apparently being manufactured by Rebtech. It does not look like any other mobo on the market, though the build quality is decent. The heatsink and fan are pretty small, though I guess that’s okay, considering that the APU is supposed to be almost idle most of the time. After all, this is not a gaming board. I have not ordered this one this time, though let me quickly elaborate on it too. Looking at the decent quality and amount of thought put into the GPU and board I have got from Rebtech, I can speculate that their 8 GPU rig is an interesting choice too. I’m a bit low on free space right now, which is why I cannot allow myself to add yet another rig to my farm. Nevertheless, I am definitely looking forward getting one as soon as I free some room for it. The package includes 8 Rebtech RX470 GPUs and a Rebtech motherboard, as well as the required PSU. You will need a metal frame for it (if you don’t have one already). There is a cheap one you can get on Amazon. Due to the nature of its components, the rig should be easy to install – the cards come with modded BIOS and the mobo comes with Windows and all the required drivers up to date. Sadly, the official Rebtech eshop does not have a quick ‘buy now’ button. Instead, you have to contact them by email first. After that, they will tell you the exact price, as well as whether or not they ship to your country. Price-wise, they definitely order great deals. At least that was in my case – I’ve got my components a bit cheaper than if I’d buy something similar on Amazon or Newegg. This is quite impressive considering their products come with pre-installed drivers and OS. I like the way Rebtech is making GPU mining easier and more accessible to the masses. Considering how unprofitable some ASICs turn out to be, GPU mining is still strong and will remain like that for quite a while, I believe. In order to further boost your GPU mining speed, you might want to check out the Acorn, which is a device that can lift the hashrate of your rig by up to 30 MH/s. Besides, this Q3 of 2018 welcomes us with several miners (mining software) getting important updates from their devs, resulting in better performance and more flexibility.